Food Technology is a branch of food science which deals with the process of food production and preservation to prevent the growth of bacteria, fungi or other micro-organisms. Journal of Food Technology and Preservation (FTP) is a newly launched journal, publishes a wide range of scientific articles related to, Food packaging, Food physical chemistry, Food chemistry, Food microbiology, Food packaging, Quality control, Food storage, Food grading etc. Our main aim is to publish the most advanced research and discoveries with current developments in the form of original research articles, review articles, case reports, short communications, commentaries, images, video articles, etc. 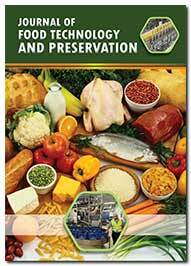 in all areas of the Food Technology and Preservation. The journal scope encompasses the knowledge in food technology and preservation including; Drying, Cooling, Freezing, Boiling, Heating, Salting, Sugaring, Pickling, Lye, Canning, Jellying, Jugging, Burial, Curing, Fermentation, Industrial/modern techniques, Pasteurization, Vacuum packing, Artificial food additives, etc.